Normally, we think of trampolines as being large pieces of equipment that a group of people can share together. But sometimes, all you need to take your workout to the next level is an affordable single person trampoline that you can use to get in shape. If you’ve never considered single person trampolines as a possibility before, never fear! All the questions you might have about this particular style of trampoline are covered in our handy FAQ below. Plus, we’ve reviewed what we think are the five best single person trampolines for sale, so you can start looking for the option that’s best for you right away. 2.1 Where can I buy single person trampolines? 2.2 Are single person trampolines good for weight loss? 2.3 Are single person trampolines good for chronic pain? 2.4 Are there single person trampolines for toddlers? 2.5 Are there single person trampolines for adults? 2.6 Which single person trampoline is the best? Looking for a great single person trampoline for sale? Here are five of our favorites. These trampolines were chosen because of their durability, price, and user-friendliness, among other factors detailed in each individual review. Pure Fun is a company we’ve written about many times before on this site. They’re known for creating relatively inexpensive trampolines that still meet a high level of quality, often aimed at children or toddlers. Because this trampoline is designed for young children who may not yet have the manual dexterity to jump on a trampoline without hurting themselves, safety was clearly the company’s first priority. 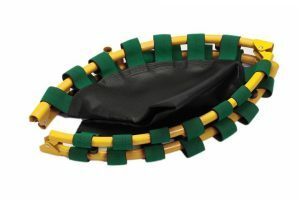 This trampoline comes with a cushioned safety bar for children to hold onto while they bounce and the springs (which little fingers can get trapped in) are covered in a thick layer of padding. The metal frame is also largely cushioned and is also famously stable and durable. It is rare for this trampoline to tip over or break even under the most strenuous use, provided your child is under the 75 pound weight limit. The Preschool Jumper only costs 90 USD at time of writing and can often be found for much cheaper in Amazon sales. Click the link below to see the best price! This is another single person trampoline for kids that we have had a lot of good experiences with. It’s weight tested for up to 150 pounds and has a 36-inch diameter, making it better for older children but still far too small for adults or most teenagers. One of the best things about the “Fold & Go” single person trampoline is right there in the name: it’s incredibly easy to set up and take down. A lot of trampolines require a significant amount of assembly, which also makes them difficult to store. In this case, the manufacturer claims that you should be able to build the equipment in only 5 minutes and should be able to take it down in the same amount of time. Finally, although the “Fold & Go” doesn’t have quite as many safety features as the “Preschool Jumper” (few trampolines do), it still has safety as a top priority in its construction. The springs are once again covered with a thick padding that is tear-resistant and there’s a padded safety handle that should make jumping up and down without falling off easy. So while we WOULD NOT RECOMMEND THIS TRAMPOLINE TO TODDLERS, there’s no denying it’s still one of the best and certainly the most convenient one person trampoline for kids. And at only 99 USD (at time of writing), it’s relatively affordable, too! Click the button below to see the best price. Most adults interested in buying a single person trampoline want to take advantage of the exercise benefits of trampoline equipment. This is one of the very best if not the SINGLE best fitness-focused one person trampolines on the market. In terms of fitness features, the InTone Plus comes with two attached resistance tubes with foam padded handles that are designed to help you with upper body training while you jump. Unlike other tubes of a similar nature these work quite well and haven’t broken for us even with regular use. The trampoline also has an attached fitness tracker (not dissimilar to a fitbit) that displays jumps per minute, workout time, total number of jumps, and calories burned during your workout. Finally, as though all of that wasn’t reason enough to buy this single person trampoline, the InTone Plus is also highly portable! Much like the Fold & Go it can be folded in only a couple of minutes for more convenient storage or transport. If you don’t care about the extra feature set of the InTone Plus and just want a serious business health and fitness single person trampoline, this Sunny model might be for you. 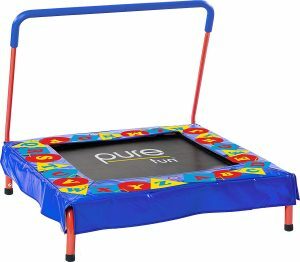 The 40 inch jumping surface is much larger than the other products on this list and the heavy frame with extra springs will allow you to jump higher and faster than with other one person trampolines. Stability and durability are once again a high priority with a heavy-duty steel frame and six sturdy, one-inch diameter steel legs. For fitness, there’s an attached stability bar that means you don’t have to worry about falling over while you’re going hard on a workout. And the portability of this trampoline is great too (seriously, we can’t stress enough how nice of a feature this is!) Not only is this trampoline as foldable as its name would suggest, it comes with an included carrying bag perfect for storage or transport. If you’re a no-frills trampoline user who wants one of the best models around, the Sunny Health And Fitness Foldable Trampoline is a great single person trampoline at an affordable price. This single person trampoline has some real pros and cons. 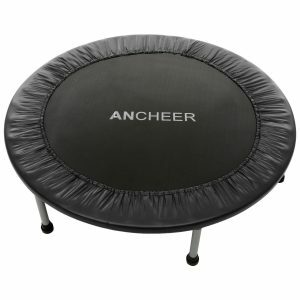 One of the nice things about the ANCHEER Mini Rebounder is that it comes in a number of shapes and styles so that you can choose the single person trampoline that best fits your needs and budget. The 38 inch model only costs $64, while the 40 inch model costs a much pricier $81 but will give you more room and a better bounce. In either case, the weight limit’s a bit low at 220 pounds, which may not work for all grown adults. However, the foam ring that covers the springs is known to fall apart under constant use and may even start to decay when left outdoors for too long. This is why we recommend buying one of the more portable models and bringing it indoors when not in use. In the end, this trampoline won’t be for everyone, but it’s still one of the best single person trampoline options out there and you might find that it’s the one you like best! Where can I buy single person trampolines? 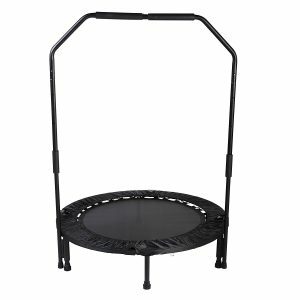 Like most items today, single person trampolines are most easily purchased online. Amazon.com usually has the best prices and often includes free shipping on one person trampolines for Prime members. If you click on any of the Amazon links we have provided above, a small portion of your purchase will go to Trampoline Review Guide, so please consider buying from Amazon if you like our writing and want to support it! Are single person trampolines good for weight loss? Yep! In fact, according to findings from NASA, 10 minutes on a trampoline burns as many calories as a 30-minute jog. And trampoline exercise puts less stress on the ligaments and joints than other workouts while also working out every muscle in the body at once because of the “fall” response. A single person trampoline is often ideal for weight loss because you can set it up indoors and use it year-round. This makes it much easier to incorporate into a daily workout than a large trampoline that has to be covered during the winter. Are single person trampolines good for chronic pain? Some research has shown that because trampolines exercise every muscle in the body at once (they tense when you’re falling and release that tension when you bounce), it may be able to reduce chronic pain and increase flexibility when combined with other workouts. And any form of regular exercise is certainly good for helping to prevent certain causes of chronic pain in the future. However, the use of one person trampolines has also been known to INCREASE chronic back pain in certain users. Bouncing can put tremendous pressure on the spine, making pain in that area worse than it would be otherwise. Consult a physician before using a trampoline if you suffer from chronic pain. Are there single person trampolines for toddlers? There are indeed! Most trampolines for toddlers are small single person trampolines. What we think of as “regular” trampolines are too big for most toddlers, who might accidentally jump off and hurt themselves. Toddler-sized single person trampolines often also come with a handle so that little tykes who are still getting used to standing and walking can still bounce with ease. Are there single person trampolines for adults? Yes, there are single person trampolines for adults. 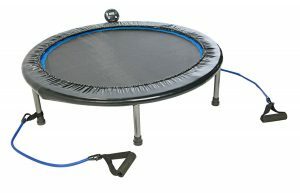 We have listed three excellent examples of this sort of trampoline in the product guide above. Which single person trampoline is the best? You know, we frequently get asked which single trampoline is the “best,” and our answer is always the same: what are you looking for? Trampolines for children are very different from trampolines for adults. Fitness trampolines will use different materials than trampolines that are just for fun. Are you looking for an exclusively indoor single person trampoline or one which can be used outdoors as well? That’s why we’ve reviewed five of the best single person trampolines which we feel fill a variety of needs and will appeal to a variety of audiences, instead of trying to find the non-existent “one size fits all” option. Now that you know more about what kind of individual trampolines can be purchased in 2018, we hope you feel that you can make a better decision when purchasing a single person trampoline for you or your child. Remember: not only are trampolines a lot of fun, they’re also a great way to get into shape!